Proposed Bike Boulevards. Map by Graham Kilmer. The public got their first look at a bike boulevard the city plans to create in Riverwest, and the response at the meeting Thursday night was largely supportive. A bike boulevard is a corridor shared by motorists, bicyclists and pedestrians alike, where the infrastructure has been designed to produce low-volume and low-speed motor traffic, to suit the needs of bicyclists and pedestrians. The plan’s impact: “Really slow down vehicular traffic so their going at the same speed as bicycle traffic would be,” said James Hannig, bicycle and pedestrian coordinator for the Department of Public Works. Various possible bicycle boulevard treatments. 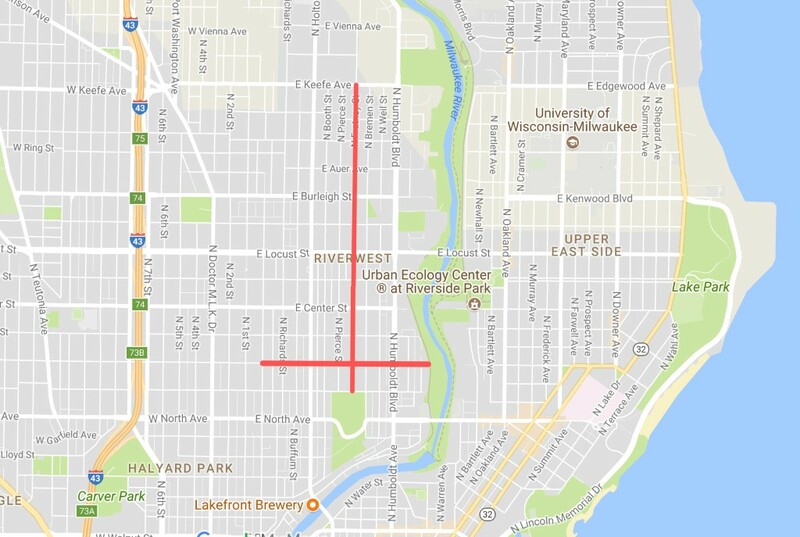 The one slated for Riverwest will be on N. Fratney St. between E. Keefe and E. Meinecke avenues and on E. Wright St. from N. Palmer St. to N. Gordon Pl. This is the first bike boulevard for the city, though Hannig said an application for one in another area of town was submitted in January. (The details of which are being kept under wraps for now, he noted.) Ultimately, the goal for this Riverwest boulevard is to be the first in a network of bike-friendly streets throughout the city. The meeting drew a sizable crowd. And residents were encouraged to use color-coded stickers on a map of the boulevard route to provide input on what sorts of treatments they would like to see implemented for the boulevard. These treatments were things like small traffic circles (similar to those on Cambridge Ave. between Locust St. and Edgewood Ave.), speed bumps, curb extensions and high visibility intersections. The price tag for the project will be around $800,000, according to Michael Loughran, senior engineer with Toole Design Group, the firm that designed the boulevard for the city. The cost for this work is largely paid for through the federal transportation alternatives program, which will cover about 80 percent of the project. The other 20 percent will be funded by the city. Rick Banks, a Harambee community organizer with Riverworks Development Corporation, said he bikes to work every day down the route proposed for the boulevard. And Banks was not alone in this: several attendees Thursday said they already bike the proposed route, some of them, like Banks, using it daily. Banks and other riders said the route is already reasonably safe, and it’s proximity to the Beerline Trail makes it a good location for bicyclists. But they also said that intersections along the route can be dangerous, like the Locust and Fratney streets intersection, and the Center and Fratney streets intersection. These are complaints the local alderman has heard from pedestrians. “I hear a lot of complaints about crossing Center and Locust on foot,” said Ald. Nik Kovac. It’s intersections like that which may discourage some from hopping on a bike to commute through the city. And really, aside from the avid bike riders in this city, that’s who this project is targeting: the casual bike rider, for whom a more controlled corridor could be the encouragement they need to get peddling. The general thrust, as Hannig said, is traffic calming. “Anything that discourages cars from using it as a very fast through route,” Kovac said. As a Riverwest resident, elected official and avid bicyclist himself, Kovac supports this project, as well as any others around the city to create more protected bike travel. While most of the crowd seemed in favor of the project, there were some that opposed. A few were concerned about parking and others about traffic from Fratney and Wright being displaced to nearby streets. Hannig and others said parking was not much of a concern, because whatever the final design of the bike boulevard, it won’t significantly reduce parking, if at all. And with Holton and Humboldt, and Center and Locust so near to the boulevard, it seems unlikely traffic will be displaced to other streets. This is great! I think more people would like to ride their bikes, but fear for their safety on the streets. This is a step in the right direction to get more people using a bicycle as a safe means of alternate transportation. Agreed, very exciting. Most other cities have had these boulevards in place for decades – since the last century in fact! It’s great to see Milwaukee starting to move forward on this approach to re-orienting the city for the use and benefit of humans beings over (or at least at the same level as) car beings. Fratney and Wright are great street choices to make this happen. I would add the fact that there are at least 3 schools along this corridor – this great way to make getting to school safer by walking or biking.